September at Robyn Bauer Studio Gallery. For several years I have been preoccupied with the story of the discovery and exploration of Australia particularly of the ill-fated French explorers Baudin and La Perouse. The fact that Australian animals and plants were collected and taken back to France has always intrigued me. Some of these specimens actually ended up at Malmaison, the home of Napoleon’s Josephine. The voyage of the Comte de la Perouse was organized due to the interest of King Louis XVI in the voyage of Captain Cook. Louis decided to send a crew that would rival Cook’s achievements. My self-portrait as Marie Antoinette with the thylacine in the background makes reference to this. There is a skeleton of an extinct thylacine in the Natural History Museum in Paris. Coming face to face with it provided me with the idea which led to this new series. The whole idea of discovery as a concept is one that I find stimulates my imagination as an artist. I have drawn and painted the animals in this exhibition with a sense of discovering them for the first time as the first Europeans would have done; not in the scientific manner of a natural historian but with a sense of wonder and excitement and an almost surreal drama. 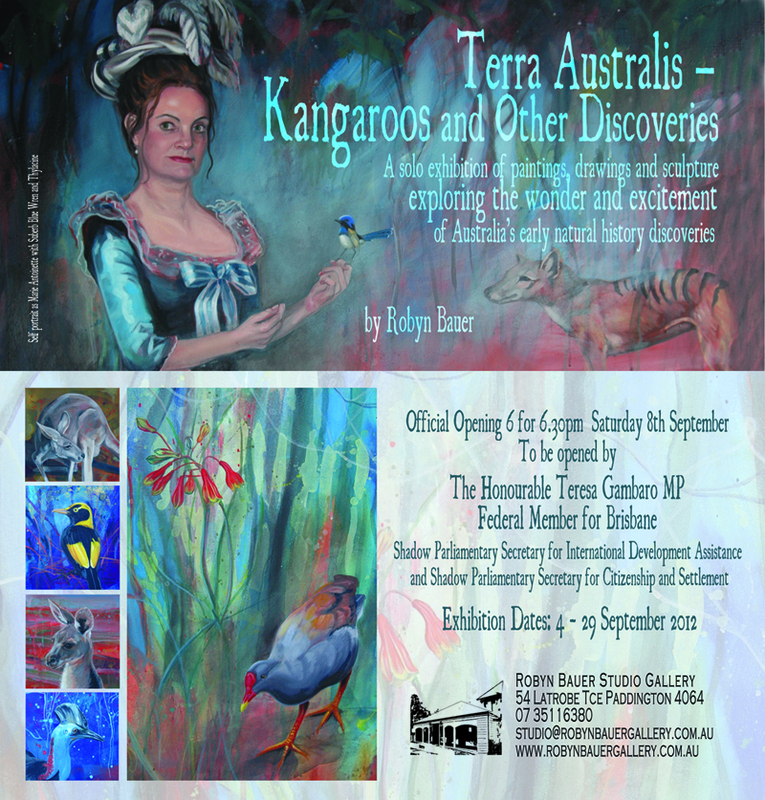 My kangaroo studies are all drawn from Lone Pine Sanctuary where I have been a daily visitor. I have taken hundreds of photographs and made numerous drawings of the kangaroos to use as reference material. After having done extensive research on the voyages of discovery and familiarised myself with my real life animal models, I have attempted to work intuitively, melding together the different genres of botanical art, portraiture and landscape elements in an original way. The exhibition will consist of large oil paintings on canvas, small specimen images, black and white drawings and ceramic sculpture. Découvertes dans la mer du sud. The disappearance of the La Pérouse expedition in 1788 after visiting Sydney Cove led to intense speculation in France. Fortunately La Pérouse had sent his journals, charts and letters back to France with a British naval ship from the First Fleet, the Sirius. La Pérouse wrote that he expected to be back in France by June 1789, however neither he, nor any of his men, were ever seen again. The valuable written documents that he dispatched with the Sirius from the in-progress expedition were returned to Paris where they were published posthumously. Many writers in France used the mystery of this disappearance as a catalyst for fantastic utopian accounts of the crew’s possible survival in the South Seas. I have used my own imagination to create a series of creatures from a mélange of human faces and body parts, birds and other sea creatures such as may have been imagined at the time. The unknown (particularly when it is on the other side of the world) is a powerful force that can provoke fear and extravagant visions. Mine are quite playful in comparison. This ties in (in my own mind) with our modern knowledge of mutations and of how species have evolved. Real life specimens of the flora and fauna from Terra Australis must have appeared equally fantastic to the people back home.